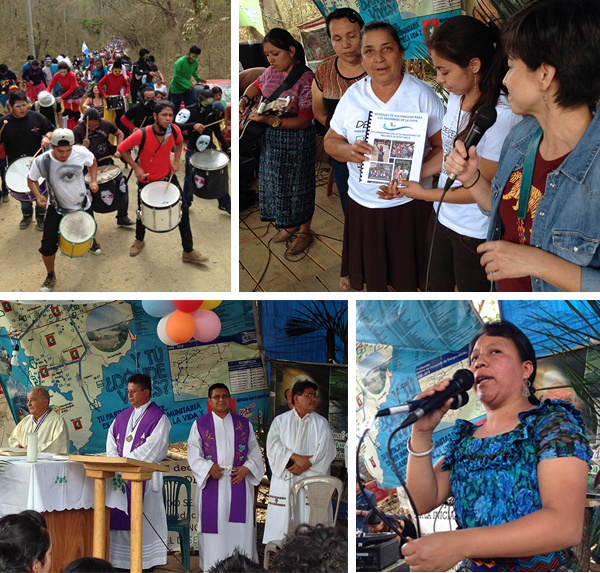 March 2, 2015 marked the three-year anniversary of the Peaceful Resistance of La Puya. In the words of the men and women who have upheld the movement, the experience has brought a sense of satisfaction and strengthened their belief in peaceful resistance. In the early morning, at the entrance of the municipality of San Jose del Golfo, people from all across the country began to gather to participate in this year’s celebration. The morning began with a march, headed by young people on stilts and a percussion group that filled the day with music and dance. Men and women, young and elderly, and children, held signs with phrases of celebration and support for the resistance. The march, to the cry of “Yes to Life, No to Mining,” proceeded through the municipality’s streets. When the march reached La Puya, a wooden stage had already been set up for a day-long cultural program, in which various national artists participated. Following each presentation, organizations and community leaders from other towns took the stage to transmit their message of solidarity and acknowledgement to members of the resistance. During one of these brief breaks, GHRC took the opportunity to share a book of over 200 messages of congratulations, solidarity and hope that came from our supporters. We also delivered a banner sent by a University of Oregon delegation that visited La Puya on August 2014. After sharing lunch together, a mass was celebrated, honoring the religious devotion and strength which has characterized the resistance movement. The evening culminated with music, filling the atmosphere and participants with the strength and hope showed by all those who joined and participated in this important event. Footage from the Asociacion Comunicarte of La Puya’s third anniversary can be seen here. In-depth background information on La Puya is available on the GHRC website. This entry was posted in Events, Land Rights and tagged La Puya, mining by ghrcusa. Bookmark the permalink.